I mentioned in another post that I was going to NYC soon for a visit, and in anticipation of that my wife gave me a small photo album (“brag book” she called it) to put photos of Madame in to show our friends. A good idea I thought, as I don’t keep photos in my wallet. Now it seems there’s a digital solution that I can get behind. 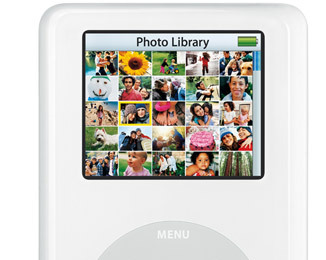 I’m sure you’ve heard by now, Steve Jobs of Apple has announced the latest version of the iPod – the iPod Photo. It’s an iPod with a color screen that holds not only your music, but all of your photos - allowing you to display them right on the color screen. The device also has video out so you can show the photos on a TV and even make slideshows with music right in your iPod. Before I had a kid I never would have cared about this, but now it seems like a great idea. I already carry my iPod around with me most places I go; now I can have pictures of my daughter with me as well. The only drawback I can see is the screen still seems like the standard iPod screen size, which is a little too small for photos for my taste. Hey, it’s not like I’m going to eBay my current iPod so I can upgrade any time soon, but I’m sure the next one I get will have this functionality.